The following guest column appeared in this morning’s Mansfield (OH) News Journal. 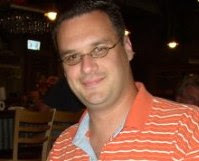 Jason Carmean (pictured) is pastor of the Grace Brethren Church of Lexington, Ohio. How big is God to you? Seriously, stop and think about it. Is the God whom you choose to serve big enough to handle what we all are facing? Can the Lord restore your retirement account after the stock market crashes? Can he still be sovereign over this country and world even if your candidate doesn’t get elected? Is the Lord ever too small to not care? We all are facing God-sized issues these days. In less than three weeks, I will be put in the middle of one of those God-sized problems. In three weeks I will be in the heart of Africa teaching at a seminary in the Central African Republic. I will be involved in training the next generation of African pastors to minister in their churches. Before you come up with your opinion, let me share some of the God-sized issues. First of all, there are over 2,000 Grace Brethren Churches in the CAR, a country the size of Texas. For those 2,000 churches, there are only 900 pastors. Each pastor oversees an average of two and a half churches. The need for new pastors is a God-sized need. The per capita income in the CAR is $700 per year. For students in the seminary, the tuition is more than they make in a year. For them to attend and even finish school is a God-sized problem. They speak a language called Sango. Everything I say will have to be translated. The teaching time will be cut in half, but the material isn’t any shorter and everything is important. That’s a God-sized issue. At the same time, I realize God is big enough to take care of it. Let me recount for you the things I have seen the Lord do. I got my passport in six days from the time I sent the application in until it was in my mailbox at home. I raised enough money in three weeks to pay for my trip (over $3,500). I have been in touch with the two other pastors I’m flying with and they have everything ready to go, too. I could go on, but I will stop with that. I guess that is part of what faith is; realizing God is bigger than us and sometimes it’s just better to place things in his hand and under his control and authority. I trust the Lord is my shepherd and that I will not want. I trust my God raises up kings (or presidents) and removes them from power. I trust God will sustain his church around the world with new pastors who have been taught and trained by some little-known American pastor who just wants to serve his big God. I have that hope and trust simply because God is big enough.